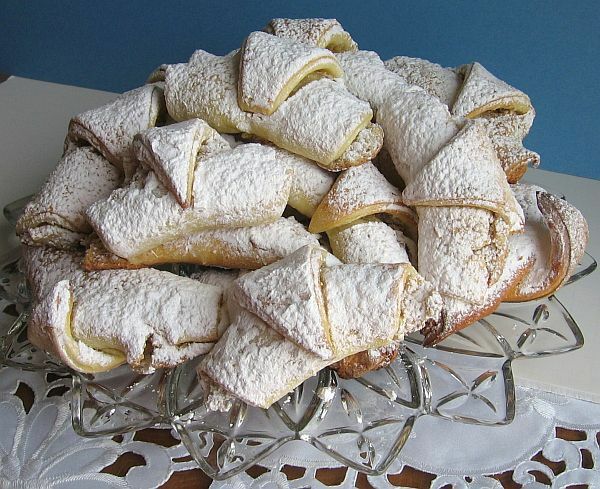 This old, traditional recipe for walnut crescent cookies is common throughout the Balkans and throughout the world. Kifle are sometimes made with a yeast dough, sometimes a buttery dough, and sometimes with a butter-cream cheese dough (probably a concession to modern times). The basic dough can actually be filled with any combination of jams, fruit fillings, almond, hazelnuts or pecans. This recipe is an old recipe that was handed down to me for a non-yeasted dough. ﻿Freeze leftover egg whites and save for leftover egg white recipes. To make the dough: In a large bowl, cut butter into flour as for pie dough. Add eggs and lemon juice and mix just until dough comes together. Don't overwork. Cut dough into eighths, wrap in plastic, and refrigerate the dough overnight. To make the filling: In a small saucepan, bring water and sugar to a boil. Add zest and let simmer 5 minutes. Remove from heat and cool. Combine cooled syrup with ground nuts until thoroughly mixed. To shape and bake: Heat oven to 350 degrees. Line sheet pans with parchment paper. If you've made walnut-size balls of dough, working with a few at a time and leaving the rest refrigerated, roll thinly and place 1 teaspoon filling at one end and roll up, curving slightly. If you've cut the dough into eighths, work with one at a time, leaving the rest refrigerated, and roll into a thin circle. Cut into wedges as for a pie. Place 1 teaspoon filling at the widest end of each wedge and roll to the point. Place the crescents seam-side down on the prepared pans. Bake 10 to 15 minutes or until lightly golden. At this point, they can be rolled while still warm in confectioners' sugar or cooled completely on a wire rack and then dusted with confectioners' sugar. The choice is yours. The former method produces a slight glaze as the sugar melts on the hot cookies. In either case, cool completely before storing tightly covered. These cookies keep well.